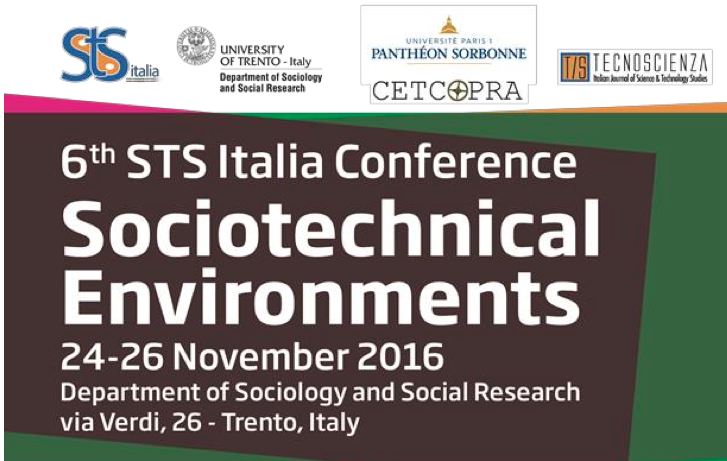 As for past editions, the Conference aims at offering the opportunity to discuss empirical and theoretical work addressing diverse aspects of the social study of science, technology and innovation from a variety of disciplines and fields (sociology, anthropology, law, philosophy, design, psychology, semiotics, history, and economics, etc.). 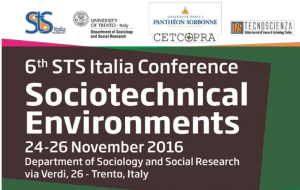 The focal theme of this year’s conference is Sociotechnical Environments. On the one hand, we are conscious that everyday and professional environments we inhabit are increasingly shaped by science, technology and innovation processes. However, these environments are not mere results of technical solutions and rational choices, but they rather emerge from a collective, dynamic and open-ended process of co-production, involving social arrangements and technoscientific processes, human actors and material artifacts, natural resources and cultural frameworks. At the same time, reflecting on the sociotechnical co-production of our social world brings to the foreground the relationship between technoscientific innovation and natural environment, turning environmental practices, politics and materialities as decisive focal points for the current research in multiple fields and intellectual domains. Under this unifying framework, the conference will be articulated in 21 different thematic sessions, focusing on several different topics, including: environmental issues, biomedical settings, robotics and algorithms, communication and digital media, scientific and professional work, design, urban infrastructures and innovation processes at large.